Reston Lloyd was founded in 1972 and produces high quality enamel on steel kitchen, melamine, and acrylic accessories to produce Corelle coordinates as well as their private brand Calypso Basics. In addition, Reston Lloyd is the exclusive distributor for both Romertopf and Mawa which are home & kitchen products from Germany. These high end quality products are one of the corner stones to Reston Lloyd, who focus on quality merchandise from Germany. German made Glazed Romertopf, has a glazed bottom and unglazed lid. The steaming method used by Romertopf surprises you time and time again by its unequalled tasty and healthy dishes and by being extremely easy to use. Each piece is handcrafted in Germany using natural clay. The unglazed top is to be soaked before use. The lid will absorb the right amount of water every time and creates a blanket of steam inside and out during the cooking process. The glazed bottom is made of a glass frit material and does not contain any non-stick chemicals. This allows for easy release and clean up. Contains no lead, cadmium, dyes or plastics. All natural and European tested. Dishwasher and microwave safe and oven safe to 900 Degrees F. Not for freezer use. 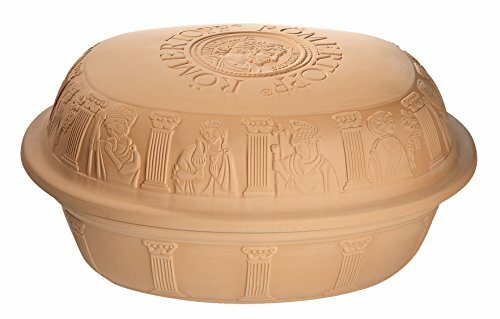 Designed from decades of tradition, this Classic Series embodies the tradition of clay cooking. The series comes embossed with pictures of traditional food images. The largest of the series is decorated with Caesar and Roman columns which reflect it's origin. Romertopf has lasted the test of time because it is easy to use and nutritious. Holds 7.3 quarts; and up to 18 lbs. ; serves 6-8 people; measures 17.25" x 13.25" x 8.75"
If you have any questions about this product by Rmertopf Germany, contact us by completing and submitting the form below. If you are looking for a specif part number, please include it with your message.